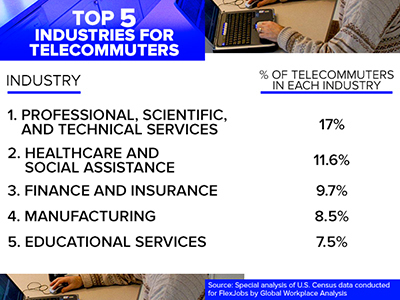 More commuters are becoming telecommuters. 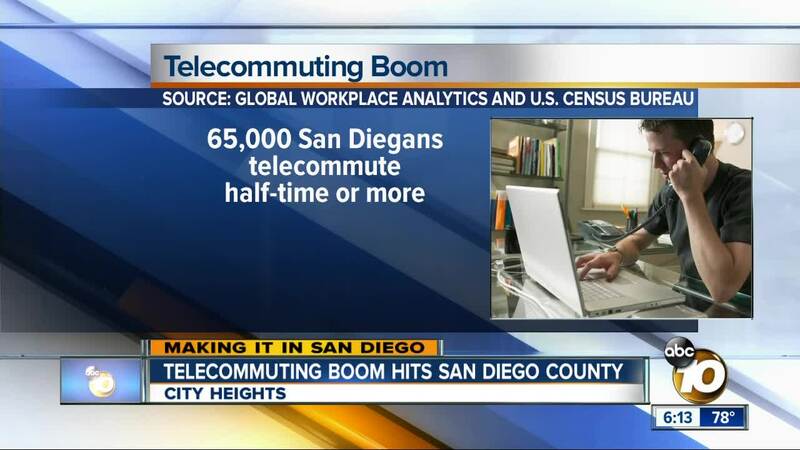 SAN DIEGO (KGTV) - Amid sky high gas prices and commuting headaches, more San Diego commuters are turning to telecommuting. Like many, Maria Parra's day at work begins with a cup of coffee. The difference is her coffee is brewed in the kitchen at her City Heights home, feet away from her office. Parra, who does coding for Sharp Health, started telecommuting in 2010. "It only took me about a week to realize how great a situation it was," said Parra. Parra says she saves thousands every year in commuting costs, from gas to wear and tear on her car. Gone are those rush hour headaches. "The time you are saving and the stress you are alleviating is great," said Parra. According to SANDAG, the average San Diegan spends the equivalent of 22 work days every year commuting to work. For full-time telecommuters, that's like getting back 22 vacation days. Those benefits are now fueling a local telecommuting boom. According to just released numbers from Carlsbad-based Global Workplace Analytics, about 65,000 San Diegans now work at least half their hours from home. That's up nearly 190% in the past decade. Nationally, that increase is 140%. Kate Lister is president of Global Workplace Analytics, which develops flexible workplace strategies for employers. She says more and more employers are taking a close look at telecommuting. "Employers can save big money in terms of productivity, lower turnover, lower absenteeism, and of course, real estate savings. They don't have to have a seat for every one," said Lister. Among those employers is Sharp Health, boasting more than 670 employees in its telecommuting program, a 16.5% increase from the year before. Lister says in all, 4.6% of the San Diego workplace telecommutes, which ranks among the top 10 cities in the U.S.